Welcome to a new year of meeting other people interested in growing roses, learning more about roses and working together on our projects. We have a great line up of speakers for our meetings, and we have 130 roses ordered for sale at Barrie and Orillia Farmers’ Markets. Location of 2014 meetings –we have moved our meetings to the Southshore Community Centre, 205 Lakeshore Dr., Barrie, right on the shores of beautiful Kempenfelt Bay. All Meetings are from 7 to 9 pm. Speaker: Joan Nieman-Agapas, Master Gardener, Member of Barrie’s Garden Club. Topic: “Ferns and Friends” Joan will show us all the different plants that can be grown in the shady parts of our property other than hostas. Speaker: Janice Schmidt, past president of HRS. Topic: “For Love of the Rose” Janice will give us basic rose-growing pointers as well as showing the beautiful Austin and other roses she grows in her garden in Barrie. Our Annual Rose Show takes place along with speakers at 7 pm. Tips on Photographing your Roses” and a hands-on demonstration -“Roses in the Home Decor”. A herb with fragrant purple flower spikes and leaves. It can be used as a freshly-cut flower in bouquets or dried to create sweet-smelling potpourri, sachets, flavouring in baking, soaps, etc. This plant can be used as a border around your rose beds (as seen in Europe, Britain, New Zealand) or just interspersed with the roses. Lavender is used with other aromatic herbs (mint and hyssop) in the Montreal Botanical Garden’s Old-Garden Rose beds to give interest all summer once the one-time blooming Old Garden \Roses are finished their early summer flush of blooms. 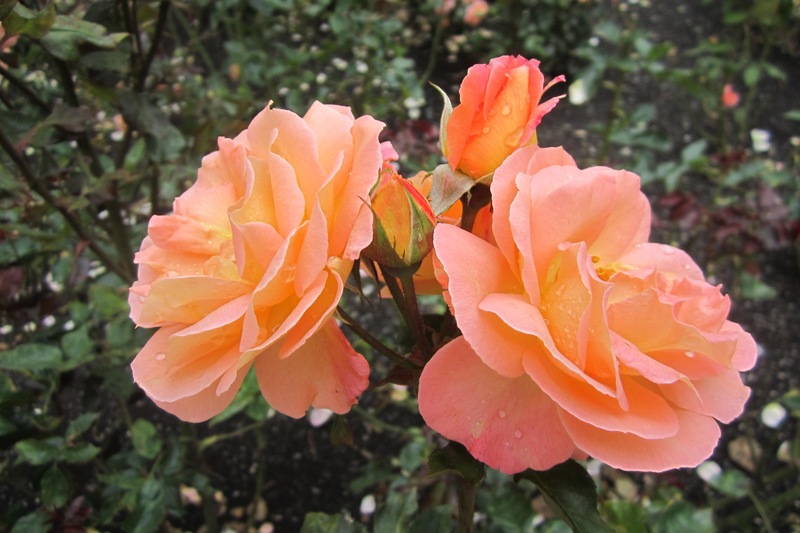 These plants also attract beneficial insects to control the insects that attack roses. They hide the bare low branches of these tall roses, and present masses of greenery with small flowers plus prevent weed growth. The hardiest perennial variety of Lavender would be Lavendula officinalis, “Munstead” strain. There are more tender varieties that probably will probably be annuals in our climate. So check out the varieties when you go to the nursery to purchase some plants. The HRS will need volunteers to sell rose bushes at the Barrie and Orillia District Farmers’ Markets each Saturday morning from 8 am to noon. In Barrie, sales will be May 3, 10 & 17; and four Saturdays at the new Orillia & District Farmers’ Market, which has moved to the Orillia Fairgrounds, right off Coldwater Rd., past the large box stores (Walmart, Home Depot, etc). The rose plants are a lovely Mother’s Day present; the more volunteers to sell the roses lessens the workload for everyone. Watch for more details in the upcoming newsletters. Please Visit our Website at www.huroniarose.com. In 2011-2012 we had an unusually warm and snowless winter. The Farmer’s almanac this past November predicted a “piercing cold” or “bitterly cold” winter this year with heavy snowfall accumulations. They were correct and we are suffering from the effects of a polar vortex. My question is, how is this going to affect my roses? Will they survive the winter of 2013/2014? First, we live in a cold zone and tender roses in this climate need winter protection. So in actual fact, the snow cover is very good for them as it protects and insulates them from the below normal temperatures. However, hardy roses will probably do well, even portions above the snowline. Once the rose has been covered the temperature will remain constant and place the rose in a stage of dormancy, providing a well-deserved rest allowing the rose to preserve the energy to come to life in the spring. Allow the snow to melt naturally as the temperatures warm up and this it will provide the necessary moisture into the soil to help the rose prepare for the growing season ahead. Enjoy your roses this summer, after winter has done a disappearing act!